Transition metal-catalyzed cross coupling between organic electrophiles and nucleophiles has revolutionized approaches to carbon-carbon, carbon-oxygen and carbon-nitrogen bond formation. Iron-catalyzed cross coupling has been a long standing interest in the field and has been identified as a “holy grail” by the ACS Green Chemistry Pharmaceutical Roundtable. Current methods operate by one-electron radical chemistry and are limited in scope due to the requirement for strong and often pyrophoric nucleophiles. We have recently initiated a project aimed at understanding transmetalation from “soft” organoboron nucleophiles with iron and cobalt complexes supported by strong field ligands. A recent publication (ACS Cent. Sci. 2016, 2, 935.) 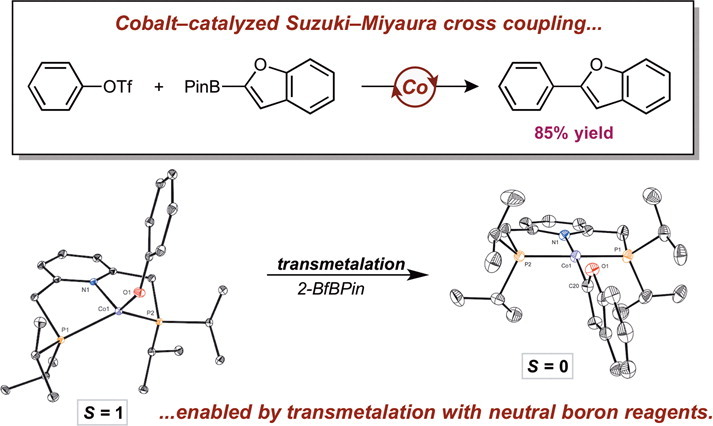 describes the first cobalt-catalyzed Suzuki-Miyaura coupling that was realized through systematic mechanistic investigations and an understanding of the electronic structure of key intermediates.